Guys, i tried to flash my Sapphire Nitro Rx480 4gb but i failed. Can someone share any rom for this card please? I have the same problem, with a sapphire nitro rx 480 4gb. You should take some time to read past posts, on Win 10 you can't just ati flash and restart. You need to mod so that it 'appears' to be signed. There is a ton of info out there on this topic, I myself posted a similar issue in this same thread. Can we use MSI RX 480 8GB? At what hashrate? Solved. Look for a rom according to the GPU and then flashing the rom, the problem was that there was an error in the flash, I solve it with a post from here. Please forgive my ignorance. 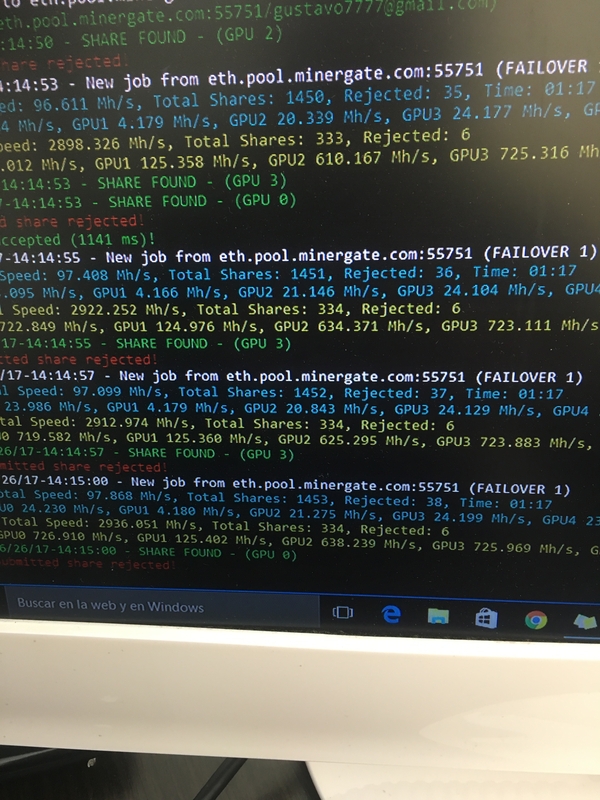 I flashed an rx480 xfx 8gb to get more hash rate and it got less. I flashed it back. My time is limited so I will pay an eth bounty for help. I have 2 rx 480 8gb with dual bios switch. I have two msi rx480 4gb armor editions. Don't laugh I got an xfx rx 560 hashing 12mh and 2 rx 550s at 8mh each. I need help to up my my rate. Not worried about power. My power is cheap here. Hello, I own 2 Sapphire rx470 Nitro (non +) dc OC 4gb and i would like to flash bios. Dont know what to do...and ideas ? I have 2 rigs running with 6 sapphire rx480 8gb each. I'm getting 24 mhs in each card. I have two main questions. What are the recomended settings to increase mhs without flashing the bios. And the other question why any of my cards dont have the V bios switch that i see in most pics and videos. I've seen similar thing on Asus Strix cards, as long as you re-flash the original bios that you saved and then modified yourself, it should be okay to flash 256KB files. Does anyone know who to tell that OC settings is "safe"? I have RX 470 Sapphire Nitro 4G (no+) with Hynix memory and i can go as high as 28.8 without any errors or mining stops. Temperature is ok, Fan speed is ok, but how to tell that GPU is not "overclocked" or set high values? There is no overheating also. Also, how to use underwolt options correct? When i lower CoreClock power usage goes down. Is that enough or correct option for "underwolt"? Hello can anyone tell me how to OC a RX strix 480 8 gb. I m using Gpu Tweak II . What i have to put in GPU clock , GPU voltage , memory clock? Fanspeed? Power target ? Rithg now each is 24 mh/s . But i would like to up. Anyone can tell me please ?? Why to flash the cards ? Is it that huge difference with stock? The risk is that you brick the card right? .. im not familiar with changing bios and flashing etc.. guess i have to do it with stock. The chance you brick you card is very small if u know what you are doing. If u got a card with a bios switch there is zero risk. U can just ask someone to do it for you, its worth the effort. But Radeon seems to perform better i read. It's dead easy to mod the AMD cards. Tweak it in the Polaris editor. Flash the BIOS (and patch the drivers if in Windows 10). Very little risk you're going to mess things up if you're just editing the BIOS you got from the card. Anyone who has a bios mod + OC that makes Asus rx580 dual oc 8gb hash higher that 29Mh/s? Try a different version of Polar BIOS editor - I also had this issue but mine was with 1.2 showing values like you have. After running 1.4 my issue was fixed. "Flash the BIOS (and patch the drivers if in Windows 10)." I have flashed my cards BIOS but I have done nothing to the drivers in Windows 10. Wasn't aware you needed to patch them in any way? You need pixel patcher. Go to Google type pixel patcher. Click on the first link and download from top comment. Just simply run once downloaded. wait so undervolt to get better memory speed? Went here to find out stuff I don't know yet but saw a massive list of questions from miners that doesn't know squat about BIOS editing nor flashing GPUs. OP should rename this to "Every questions about BIOS flashing there is in the world wide web; answers not guaranteed"